This super cute set of miniature cat dishes with oval mat are for your 1:12 scale dollhouse. 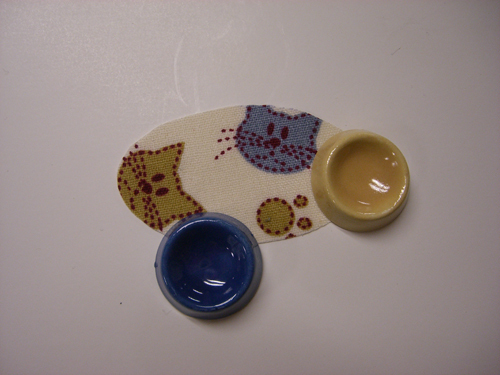 The miniature cat bowls (2pc as shown) measure 0.80" in diameter and the mat (print may vary with location of cut on actual fabric) measures about 2" wide. This Cat Dishes & Mat Set is supplied by Handcrafted Miniatures By Barb, which generally ships within 1 business day(s) of you placing your order .